Nuclear Medicine (NM) – Wayne Radiologists, P.A. 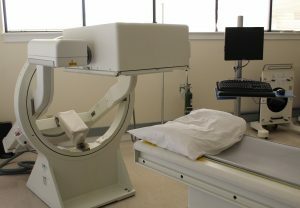 Nuclear medicine is an imaging technique that uses radioactive materials. The radioactive materials can be administered by injection or by mouth. The radioactive material will be administered at our office. The radioactive material must have time to be properly absorbed by the body before it can be imaged. The time required varies depending on the exam performed. You may be asked to stay in the office during this time or you may be able to leave and come back. During the scan you will be asked to lie down on the imaging table and remain as still as possible while the images are being obtained. The technologist will let you know when you can relax and reposition. Lying still is required to obtain clear, motion-free images. The length of time required for the scan varies depending on the exam ordered. The radiologist will review your images and may request additional x-rays to go along with your scan. Preparation varies depending on the body part being examined. Your doctor will provide you with specific instructions for the type of exam you are having. If you have any questions about your exam prep, you can call our office directly at 919-734-1866. You must have an order from your doctor to schedule an appointment for a nuclear medicine scan. In most cases your doctor will schedule the appointment for you and will inform you of the appointment date, time and prep. If you have questions about your appointment or need to reschedule you can call our office directly at 919-734-1866. How will I find out the results of my exam? Technologists are not allowed to give exam results. In most cases you will not know the results of your exam before you leave our office. A written copy of the results will be sent to the doctor who ordered your exam within 24-48 hours.